Fluke 750P Series Pressure Modules Suppliers, Dealers, Importers, Authorized Distributors and Stockists of Fluke 750P Series Pressure Modules at all over Tamilnadu, Chennai, Coimbatore, Hosur, Ambattur, Madhya Pradesh, Karnataka, Bangalore, Mangalore, Andhrapradesh, Hyderabad, Sri City, Vizag, Pune, Gujarat, West Bengal, Madhya Pradesh, Hosur, Ahmedabad, Uttarpradesh, Kerala, Cochin, Trivandrum, Telengana, Gujara, Noida, Delhi and Mumbai	Product Details: Key features: Precision Pressure Measurement for 75X and 720 Series Calibrators The 750P Series Pressure Modules are the ideal pressure modules to enable gage, differential and absolute pressure measurement with Fluke 750 and 740 series DPCs and 725, 726 MPCs to measure pressure. * Up to 0.01% reference uncertainty * 6-month and 1-year specifications * Temperature compensated 0°C to 50°C * Digital communication to calibrators, no analog losses or errors * Broad selection of ranges * Gage, differential, dual range, absolute and vacuum measurement models * Eight (8) Intrinsically Safe models that are certified to: * NEC-500: Class I Div 1, Groups A-D, Ga * ATEX: II 1 G Ex ia IIC T4 Ga * IECEx: Ex ia IIC T4 Ga *All certifications: Ta = -10 °C to +50 °C Product overview: Fluke 750P Series Pressure Modules A Complete Family of Pressure Modules A family of 50 pressure modules covers pressure calibrations from 0 to 1 inH20 to 10, 000 psi (2.5 mBar to 690 bar). Gage pressure modules have one pressure fitting and measure the pressure with respect to atmospheric pressure. Differential pressure modules have two pressure fittings and measure the difference between the applied pressure on the high fitting versus the low fitting. Each module is clearly labeled for pressure range and media compatibility. All modules include NPT, metric (BSP) and M20 adapters. Compatible with all documenting, multifunction and pressure calibrators (including: Fluke 754, 752, 726, 725, 721, 719Pro, 719, 717 and legacy 741, 743, 744, 701 and 702 calibrators). 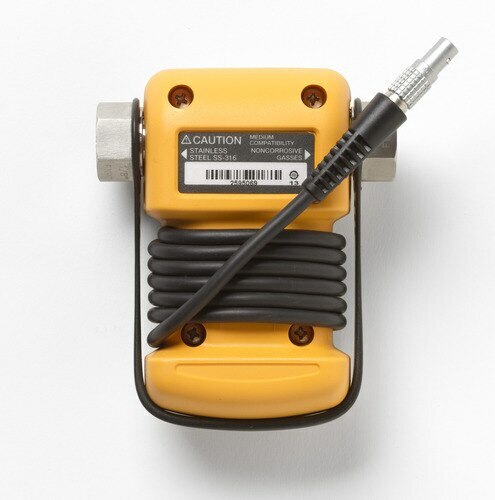 Quick and Easy Measurements Fluke 750P Series Pressure Modules are easy to use. To measure pressure, connect the pressure module to a pressure source or hand pump and then connect the pressure module cable to the calibrator. Apply pressure from the pressure source and it is displayed digitally on the calibrator. At the touch of a button, the pressure may be displayed in up to 11 different engineering units. When used with the 750 Series Documenting Process Calibrators, pressure readings can be date/time stamped and stored electronically for later retrieval. This saves time, eliminates errors, and supports compliance with quality standards and regulations. Choose from: * Differential modules * Gage modules * High pressure modules * Absolute modules * Vacuum modules * Dual range modules * Reference modules * Intrinsically safe modules * Other useful features: Communicates measurements to calibrators in digital form, eliminating errors due to poor connections and electrical interference Offers broad selection of ranges Enables gage, differential, dual range, absolute and vacuum measurement models Features a stainless steel diaphragm to isolate the sensor (in many models) Features a rugged urethane overmolding to protect against shock being dropped and also seals against dirt, dust, and moisture.